From 2016-2018 she was appointed to East Texas State Social Action Coordinator and served on the Spring/Summer 2018 issue of the Archon Editorial Committee for the Southern Region. 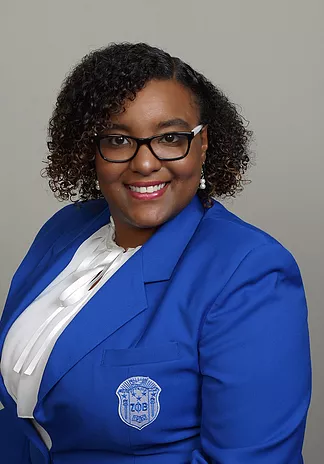 Soror Johnson is a Centennial Charter Visionary Donor and 2017 ZOL Certified. care and prevention field for over 10 years. For the last 5 years she has worked as the HIV Health Planner at the Houston Regional HIV/AIDS Resource Ryan White Grant Administration Agency that funds over 13 million dollars to 51 counties in Eastern Texas. In 2013, she founded Just A Touch of H.E.L.P., Inc. (HIV/STD Education, Linkage to Care & Prevention) to address and educate on rural HIV on the national, state and local stages. She’s active in her community and organizational membership includes; Shilo Missionary Baptist Church, Butterfly Project, Inc. Mentoring Program, Texas Black Women Initiative on Health, African American State of Emergency HIV Task Force, Fort Bend Black Heritage Society, National Association of Black Social Workers and appointed to the Fort Bend Historical Commission.